The Unmanned Underwater Vehicles Showcase has long been a feature at Oceanology International 2016 (OI 2016), which is taking place at ExCeL London, UK, from 15-17 March 2016. This conference strand, organised with the Society for Underwater Technology (SUT), has been expanded to cover autonomous surface vessels (ASVs), hence its new name, the Unmanned Vehicles and Vessels Showcase (UVVS). It has also been extended into a day-and-a-half-long conference. Like all OI conference sessions it is free to attend. The half day on Wednesday 16 March will concentrate on technology and instrumentation; then the full day on Thursday 17 March will focus on the future of AUV operations, applications for AUVs, swarm robotics and surface vehicles. The contents of the conference stream are mirrored in the exhibits on the exhibition showfloor, OI is seeing an increasing number of ASVs on display. Conference co-chairs Dr Bob Allwood, chief executive, Society for Underwater Technology (SUT) and the SUT’s Business Development executive, Ian Gallett, expressed to be blessed with a very strong set of papers submitted, making it hard to select those to be presented, even with the expansion of the programme by an extra half day. The presentations will cover a look into the future of autonomous underwater vehicles (AUVs), their applications and the increase in their cost-effectiveness by deploying them in swarms. 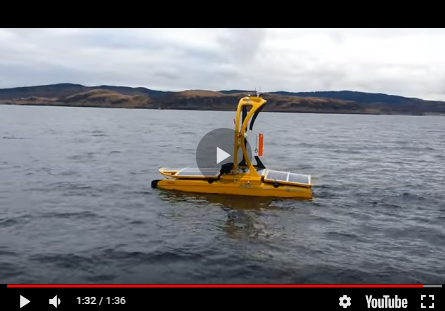 Also included are autonomous surface vessels (ASVs) and a detailed look at some of the developments in technology that these and the AUVs can utilise to further increase their usefulness. Apart from looking into the future with the reports of new developments, results from trials and operations are also reported. Under the heading ‘Technology and Instrumentation’ there will be five presentations on the morning of Wednesday 16 March following the opening remarks by Bob Allwood and Ian Gallett. The first speaker is Mark Atherton, manager of Business Development and Special Projects at Kongsberg Mesotech Ltd looking at ‘Technical innovations to domed scanning sonar improve performance in deepwater operations’. This will be followed by ‘Extremely rugged but thin, buoyant optical cables’ delivered by Stephen O’Riorden, director of Business Development at Linden Photonics. Angus Lugsdin, Business Development manager of Tritech International will then give his views on ‘A new approach to acoustic velocity logs for underwater navigation’; prior to a look at ‘Remotely controlled subsea drill’ by Rodrigue Akkari, director, Applied Concepts in Data Acquisition. The final speaker of the morning is Pere Ridao, director of the Computer Vision and Robotics Research Institute at the University of Girona who will talk about ‘3D areas with strong relief with hovering capable AUVs’. Moving on to the second day of UVVS (Thursday 17 March) the morning will start with Graham Lester, vice president, Hydroid Inc’s look at ‘Where do we go from here? – The development of the next generation Autonomous Underwater Vehicle technology’. ‘Swarm Robotics’ then come under the conference spotlight with three presentations. The first is by Luc Simon of RTSYS, on ‘An effective swarm of high-speed compact and long endurance AUVs’; to be followed by ‘Swarm AUVs for environmental sensing at high spatial resolution’ being given by Felix Schill, co-founder of Hydromea SA. The final speakers in the session are Dr Chris Haworth, Business Development manager, SeeByte and Dan Hook, managing director, ASV, with their joint presentation on ‘Developing adaptive behaviours for unmanned and autonomous maritime systems’. These presentations are followed by a four-paper session on AUVs and their applications. Total Meocean specialist Lattes Philippe will speak on ‘Underwater glider platform survey for oil and gas exploration’; to be followed by Roland Rogers, Maritime Sector lead at the National Oceanographic Centre telling his audience about ‘Advancing deep sea operations for unmanned vehicles’; with Per Espen Hagen, senior principal engineer, Kongsberg Maritime looking at ‘Pipeline tracking with AUV: Operational experience and lessons learned’; and BG Group’s Subsea Developments Manager, Phil Bremner, delivering ‘Flatfish – A compact subsea resident inspection AUV’. ‘Surface Vehicles’ is the final session of the conference stream. Justin Manley, managing director, Just Innovation LLC will speak on ‘ASVs as tow platforms: Wave Glider experience and results’; to be followed by Vegard Evjen Hovstein, CEO of Maritime Robotics AS with ‘Unmanned Surface Vehicles (USV): an efficient tool for maritime data acquisition’; and lastly James Cowles, Science and Survey product manager, ASV will talk about ’Using autonomous surface vehicles for Passive Acoustic Monitoring (PAM)’. Further information on all aspects of Oceanology International including visitor registration is available online. Find more information on www.geo-matching.com! Follow Hydro International on Facebook, LinkedIn, Twitter or sign up for the newsletter! Don't miss the latest developments: join Hydro International!